The world-buulding is truly exceptional. The author has created not just a single city or even a single state; he has created an entire world that is like a MAD MAX version of a mixture of Tolkein’s Middle Earth and Medieval England. 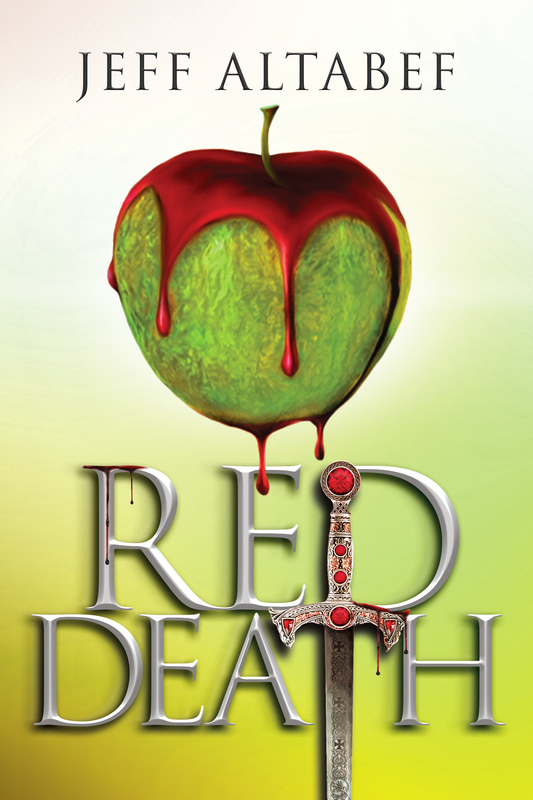 RED DEATH is a story of teens surviving in a world where even the air they breathe can kill them. They need to learn to adapt and they need to learn to plan for the future. They must achieve all of this in a world where corruption and greed hide in the most unexpected of places. The story takes place many centuries after a virus was unleashed on the world and decimated the human population. Survivors have splintered into tribes and the virus is still a problem. No one lives long past the age of 21 – eventually they all succomb to the virus that permeates the very air they breathe. There is one colony that was isolated from the rest of the world during the Apocalypse. The virus – THE RED DEATH – is still a problem and no known cure exists, but the people of Eden are protected by isolating the air they breathe and by killing anyone who comes too close to their hidden sanctuary. Trained “Guardians” are responsible for keeping Eden safe. One of those Guardians is seventeen year old Aaliss. She is the best of the Guardians and takes her job very seriously. She also takes the job of protecting her thirteen year old brother Wilky seriously. Wilky may only be thirteen years old, and a bit – OK, A LOT – strange, but he is also a genius who discovers a cure for the plague. When the High Priest finds out about the cure, he sees it as a way to solidify his power. There is just one small problem – Wilky and his sister Aaliss. He needs them gone for his plan to succeed so he brands them traitors. The penalty for being a traitor is death and so Aaliss and Wilky run for their lives. Aaliss had been told from birth that those who lived outside of Eden were savages who had no souls. But as Aaliss spends time with the people of the Tribes, she starts to believe that maybe, just maybe, everything she ever thought she knew was a lie. The characters in this book are written so vividly that they start to feel real to the reader. They fairly leap off the page and are complex and believable. RED DEATH contains dynamic writing and an epic plot-line that will keep you on the edge of your seat. Not only is this book highly entertaining but it also examines topics that everyone can relate to. Aaliss’s struggle between believing in what she has been taught her entire life and what she has witnessed and experienced for herself is reminiscent of the struggle for youth to follow the religion of their parents. The High Priest turning on Aaliss and her brother teaches readers the lesson that what people are like in public and what they are like behind closed doors are not necessarily the same. There are so many facets to this story that I actually plan to re-read it because I believe I might even enjoy it more the second time around. Although this book is targeted at a Young Adult and New Adult readership, I firmly believe that it can (and will) be enjoyed by readers of ages 14 to 114. I cannot recommend this book highly enough. I rate it as 5 out of 5 Stars, but would rate it higher if that were possible. Jeff Altabef is an award-winning author who lives with his wife, two daughters and Charlie the dog. He writes adult thrillers and young adult fantasy novels. Often he can be found wondering hiking trails with Charlie discussing the fine points of his stories. To date, Charlie puts up with him, but that could change at any moment. Jeff volunteers at the Writing Center in his local community college. He believes that everyone has stories to tell and enjoys helping others tell them. He’s also an avid Knicks fan, which explains why he goes through long morose periods during hoops season.